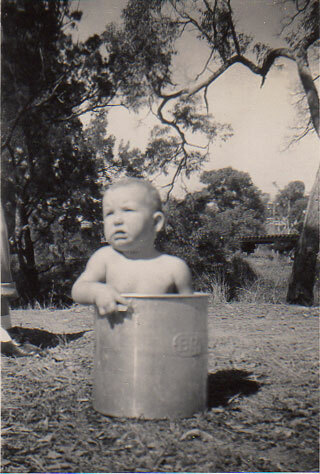 I was born in Brisbane back when slates and slate pencils were used. The child with one of the new style detergent squirt bottles was King – able to squirt a thin stream of water onto a full slate so we could wash it with a little sponge then dry it with a yellow cloth. No writing in books until grade three. 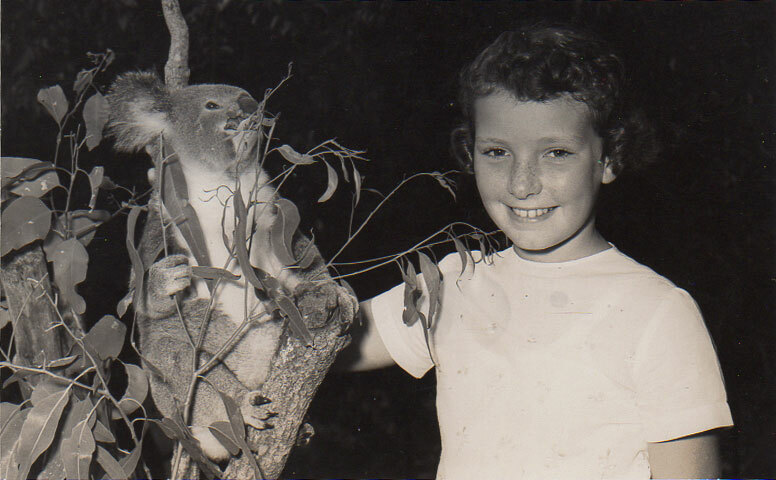 When I was young, I loved koalas. I had 3 toy koalas who sat and watched me sleep; Coakey, Doakey and Smokey. I had koala writing paper and a koala photo file. Any chance I got, I tried to squeeze one at David Fleay Wildlife park. An inspector came to our school when I was in grade 4 and, trying to be smart, asked if anyone knew the scientific name for a koala. I did. He left. Once I get into something, I really get into it. I have native bees. I read on the train. I knit and sew outfits for dogs. I ride my scooter around town. I am an active member of my local rural fire brigade. I taught myself to ski (not well at all, but well enough to not embarrass anyone I know). I have two of the best grown-up kids in the world and now two top notch grand-daughters. My ever patient husband does all of the graphic arts to support the Sandra Watkins Dream of One Day Being a Writer As Well As a Teacher. AND, I have two jack russells; Linda and Harry. I started teaching my brother and sister at a blackboard under our house when I was five, but was formally qualified in 1977. I trained at the new Capricornia Institute of Advanced Education in Rockhampton. We were very lucky that most of our lecturers were from the UK or Canada so we were taught to teach the child centred day – a belief system that means every child gets what they need, how they need it and when they need it. Makes perfect sense. Most of my teaching has been in small schools with multi-age classes. I have a Masters of Educational Studies from Newcastle University and a Diploma of Teaching (Primary) from what is now the University of Central Queensland. I would love to start a PhD, studying changes in the brain that accommodate a child’s learning to read. So, when I retired, I thought I’d get really busy and write. In 1990 I was awarded the Year of Literacy National Award for the best literacy teacher in Australia. Perhaps I could write something kids would love to read, match the ACARA guidelines to make life easier for teachers, and give me the chance to find out even more about what’s going on around us. I have written two books about The Plague that actually came to Australia (and Brisbane and Townsville) in 1901, and the tough little dogs that saw the plague-infested rats off. These are non-fiction and full of disease and dogs. The Very Ratty Problem: for 5-7 year olds. Rodent Patrol and the Plague: for 7-10 year olds. Then I read about something funny that happened under New Farm Park one day and so wrote a book about other things that are under the ground in the city. What’s Under the City: for 9-12 year olds. The History of The Ekka: for 8-10 year olds. My old jack russell Jimmy (who has since gone to that big rabbit field in the sky) had been telling me about his pony which apparently lives in a cupboard, even though we have never seen it, so I wrote it down, just to keep him quiet. My Dog Has a Pony: a board book for little kids with sharp eyes. Teachers, parents and home schoolers: check out the My Books page for more details, and the resources that match their ACARA guidelines. Let me know how it goes – what worked and what didn’t. Feedback is good. There are SO MANY really neat things that turn up online and in other sources, that I have made a space just for them. It will change quite a bit so keep coming back to check. Let me know what you think too, as you are my customers.